So then back to the usual, monochrome. 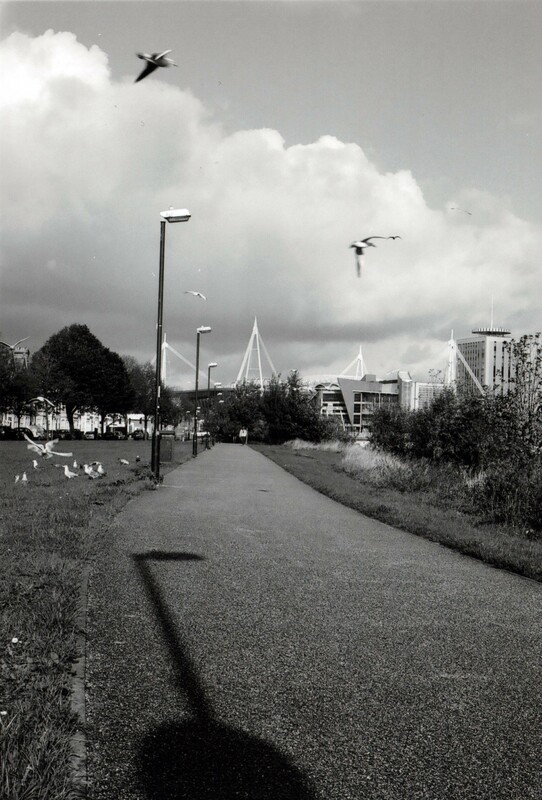 This shot of the path that runs parallel to the River Taff in Cardiff was taken on the Canon AE-1 Program with 50mm on Ilford XP2 400 ISO film. This isn’t the first image I’ve posted of this particular area, or a scene similar to this, I do however particularly like this example as there’s an awful lot going on and the moment of capture has frozen some good talking points. Firstly the path leading off into the distance, drawing your eye towards the lone figure walking towards us with the symmetry of lampposts lining the path, symmetry that can even be seen from the shadow being cast at the very bottom of the image. The huge, fluffy, grey-ish white cloud gives a nice filler for what would other wise be a very empty top of the frame, the cloud also leads down at a diagonal angle, an angle that the two birds caught in flight look as if they’re following. What I also like is how that huge cloud dwarfs over the buildings in the background, not small buildings either, giving a sense of man reaching up to the sky and being shown how futile that attempt is in comparison to what nature can produce.